Available in different specifications, these pumps are suitable for vacuum drying, distillation, evaporation, filtration and water extraction from paper and cloth. Owing to features such as high operational fluency, robust construction and easy installation, our Water Ring Vacuum Pump is widely appreciated among our clients. Capacity : up to 2000 m3/Hr. We are Looking Inquires Mainly From Gulf Countries i.e. Kuwait, Bahrain, Iraq, Oman, Qatar, Saudi Arabia and the United Arab Emirates (UAE). Maximum Vacuum with Close Suction: 720 mm of Hg. 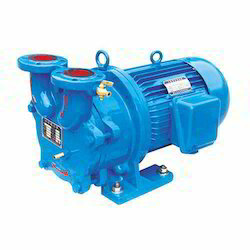 Kalbro Manufacturing Co. is pioneer Water Ring Vacuum Pumps manufacturers, suppliers & exporters based in India. These are widely used in several applications. We have manufactured these as per industry compliance to offer long operating life and high operational efficiency.